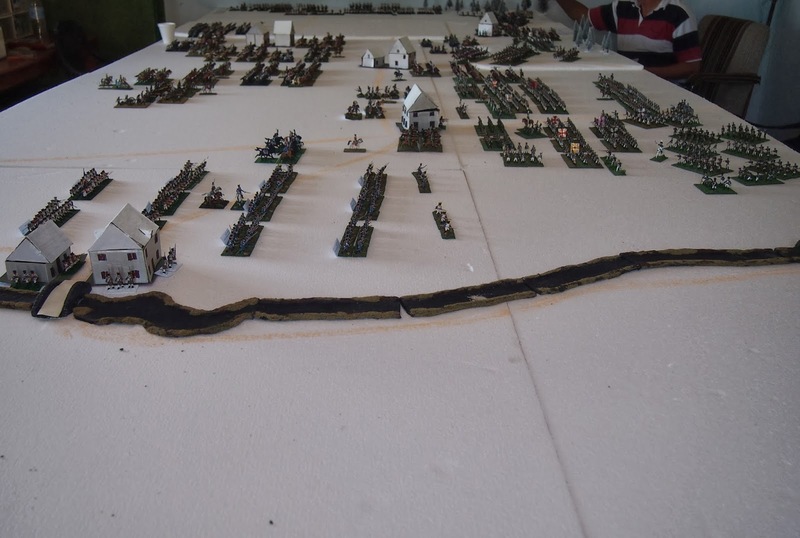 Here are some views of the initial set-up. 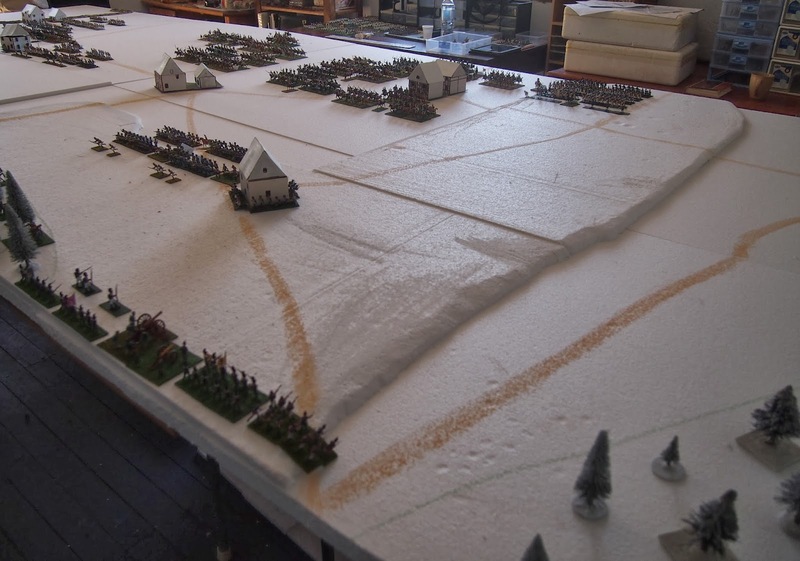 The cold, snow-covered battlefield contrasted nicely with the mid-thirties (ºC) of the real world. 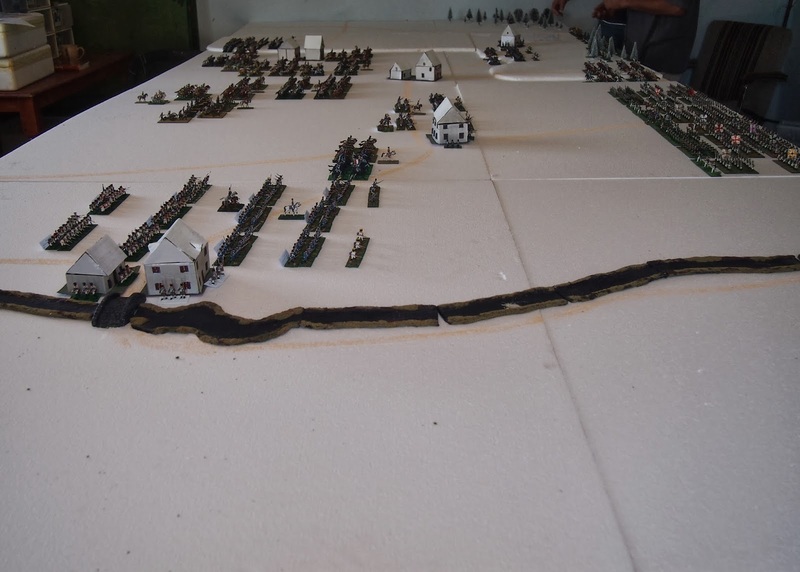 Here we are looking roughly east, with Dienville and the River Aube in the foreground, the former defended by Gérard's Provisional Corps. La Rothière is in the centre of the photo. 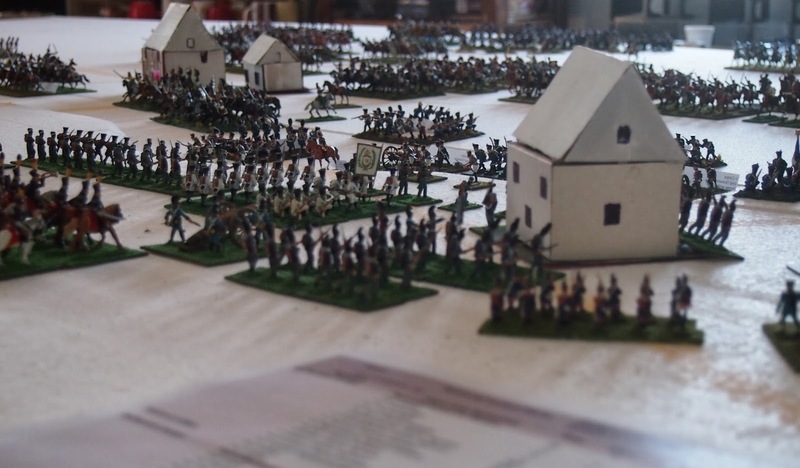 At the other end of the table we see the town of La Giberie, defended by Porliers' division of Victor's II Corps, with Stockmayer's division of Eugène of Württemberg's IV Corps moving to the attack. Looking across the table from the (roughly) east. 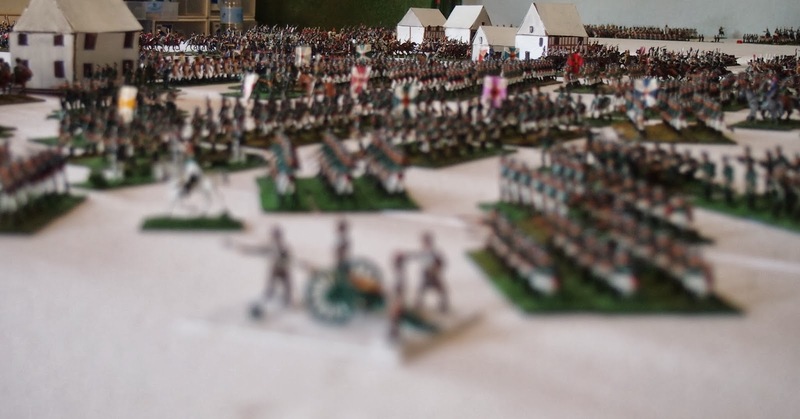 Looking over Dienville towards La Rothière; Gerard's troops in the foreground. 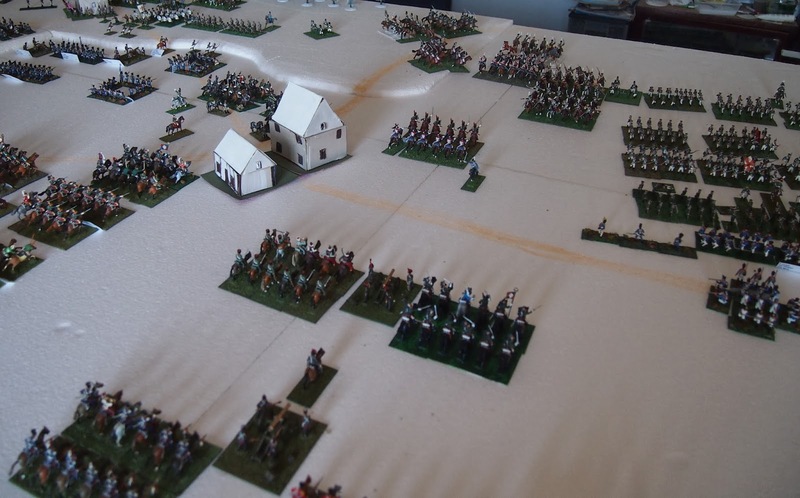 Stockmayer's division moves to attack Porliers' weak defence around La Giberie. 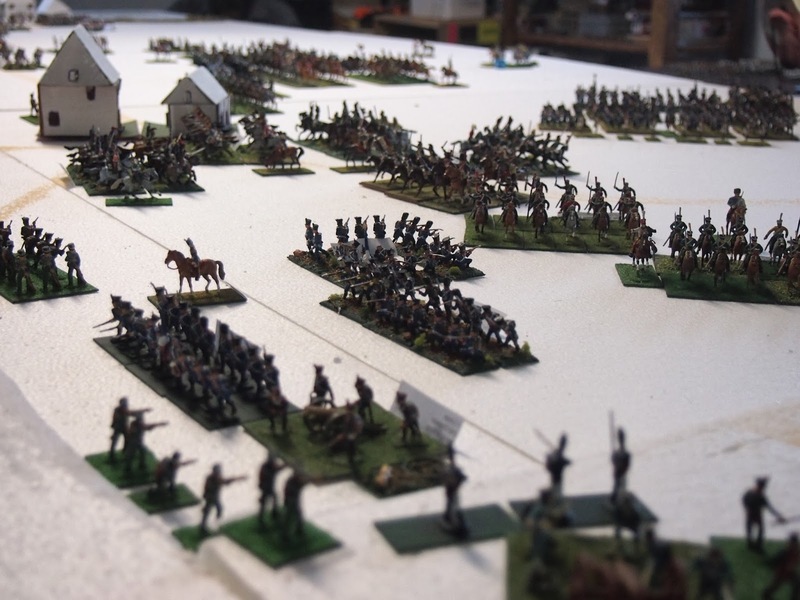 Panchulitzev I's dragoons, closest to camera, and Lanskoi's hussars moving in support of Stockmayer's and Bernadosov's divisions. 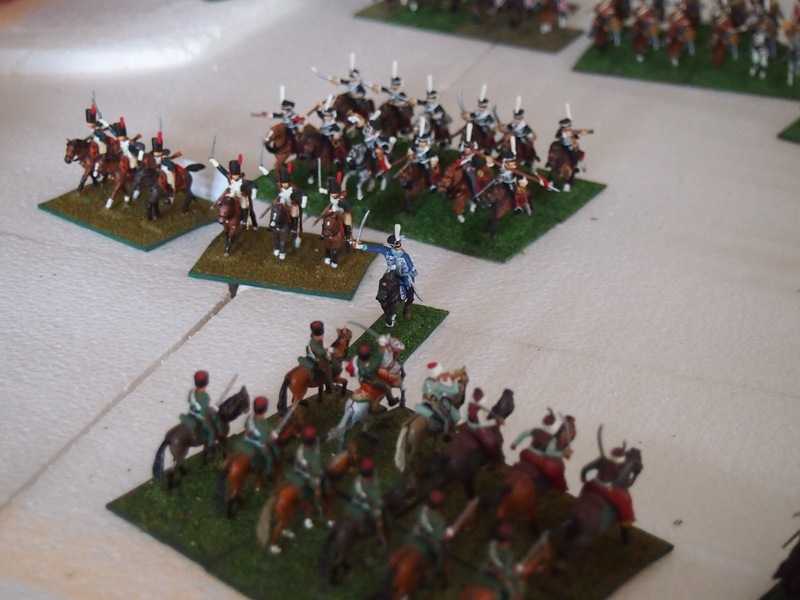 First combat: Piquet's 10e hussars charged the lead unit of Talysin's division. 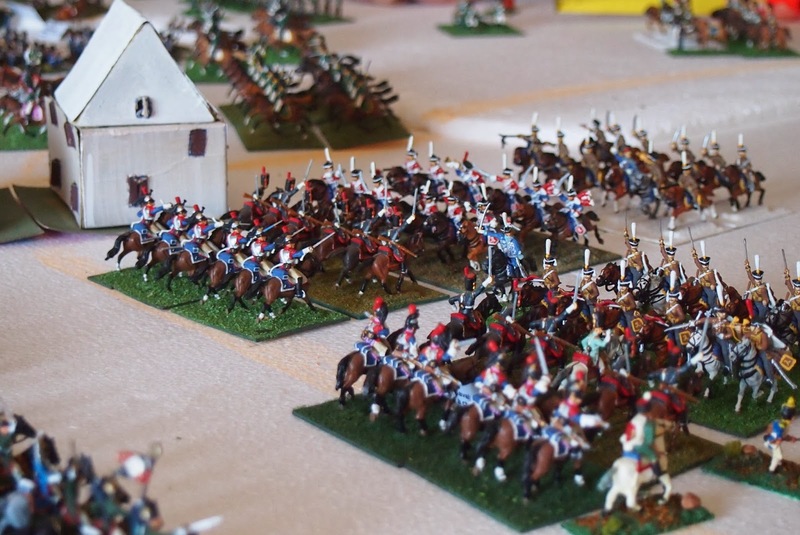 The latter formed square, so the hussars 'bounced' with modest losses. 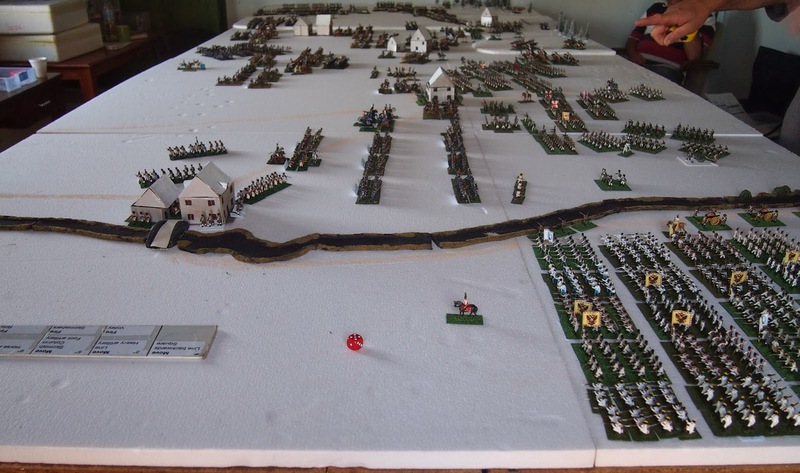 Meanwhile, to the left (east of this action), Bernadosov's 28th and 32nd Jäger moved to attack Duhesme's division (Victor's II Corps) in and around La Rothière. 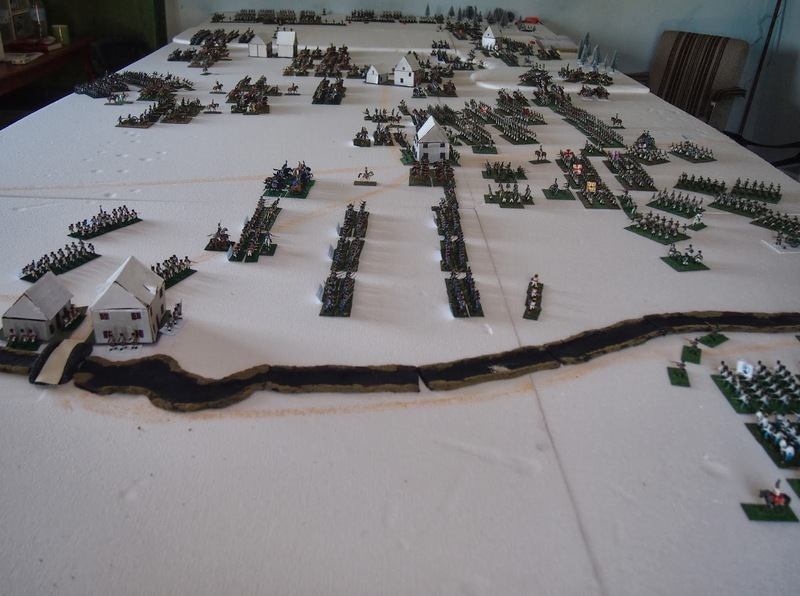 View of part of the table from the French side. 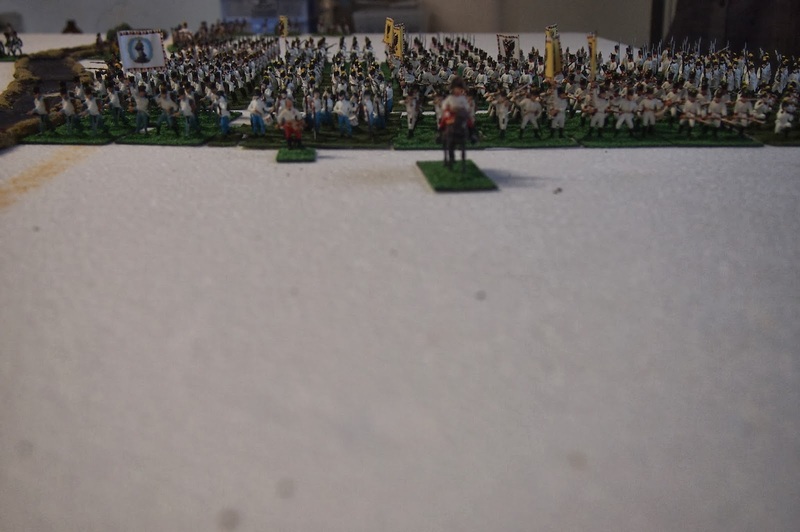 Napoleon (near bottom-centre of the photo) has sent new orders to Milhaud's cavalry, which is stationed between Petit Mesnil and Chaumesnil (roughly top-centre of photo). 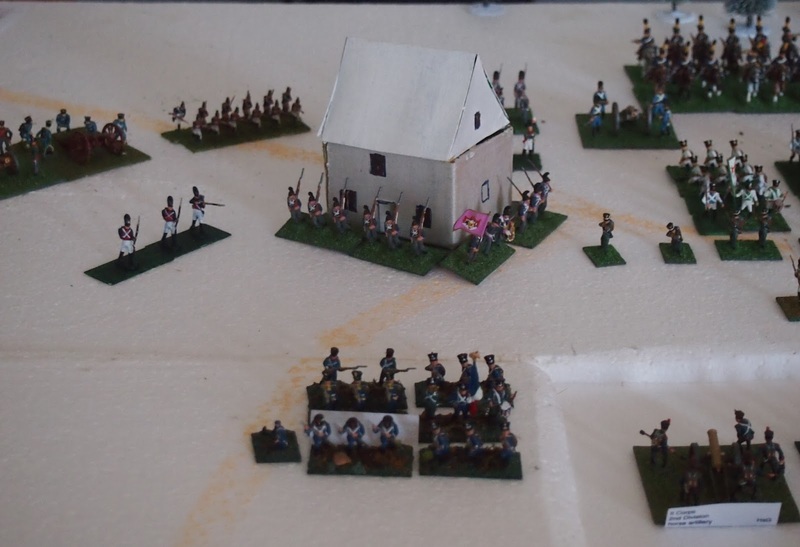 Porliers opted for a defensive retirement in the face of the onslaught. 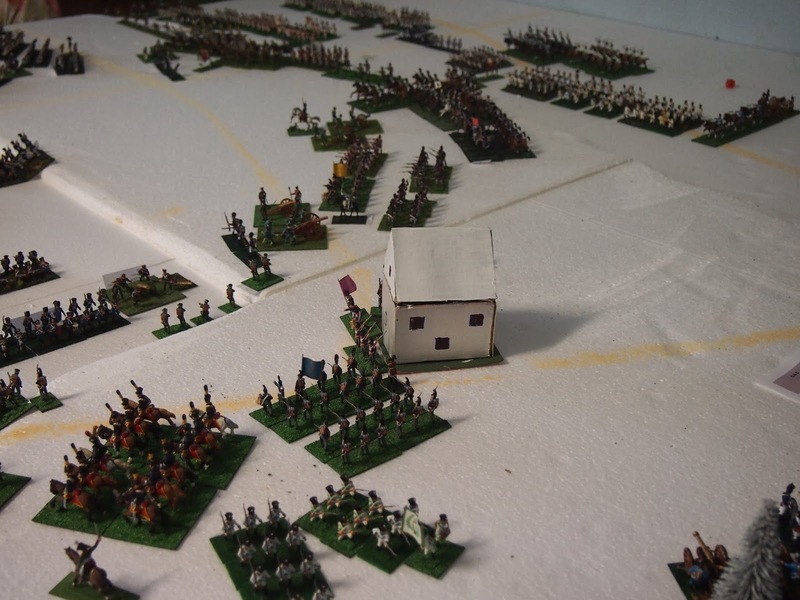 Here come the Austrians! 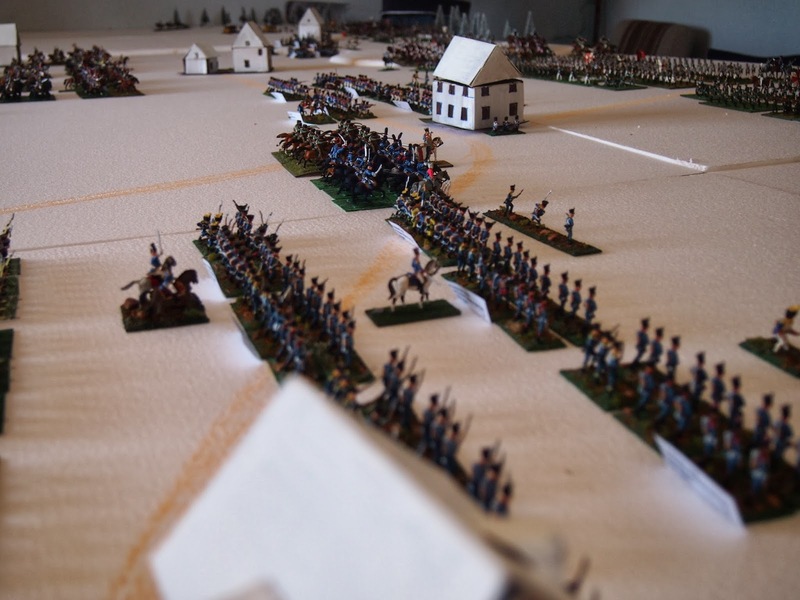 Gyulai's III Corps begins its flanking attack towards Dienville. 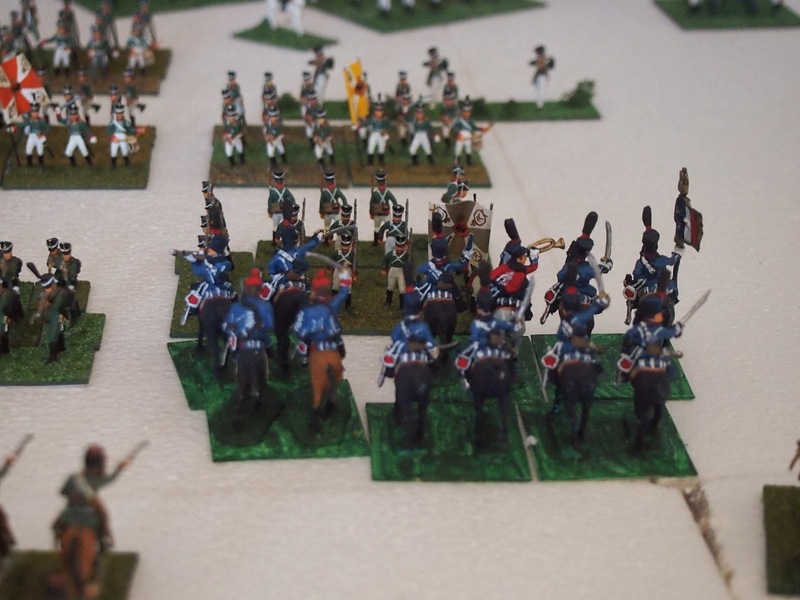 The 1e gardes d'honneur (heavily disguised) keep Talysin's lead units in square while, to their left, the first assault goes in against La Rothière. 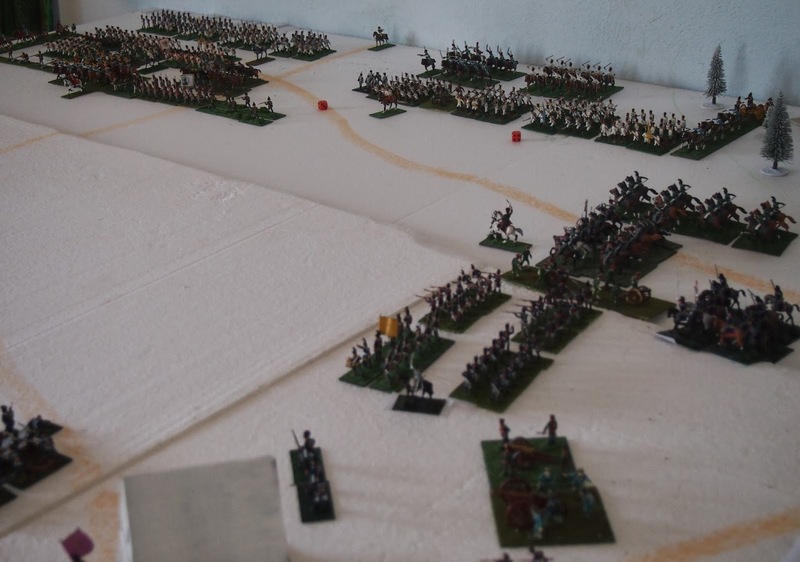 with the support of Lanskoi's hussars to threaten the left flank of Duhesme's division. Nansouty to the rescue? 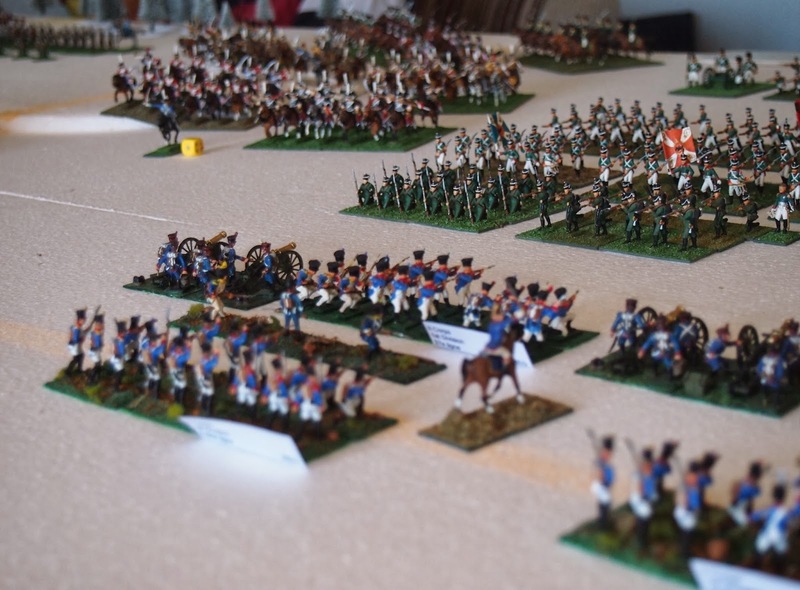 He sent forward Guyot's guard heavy cavalry; old guard grenadiers à cheval on the right and young guard on the left (those cuirassier figures are a figment of your imagination... i.e. used to make two units from one). 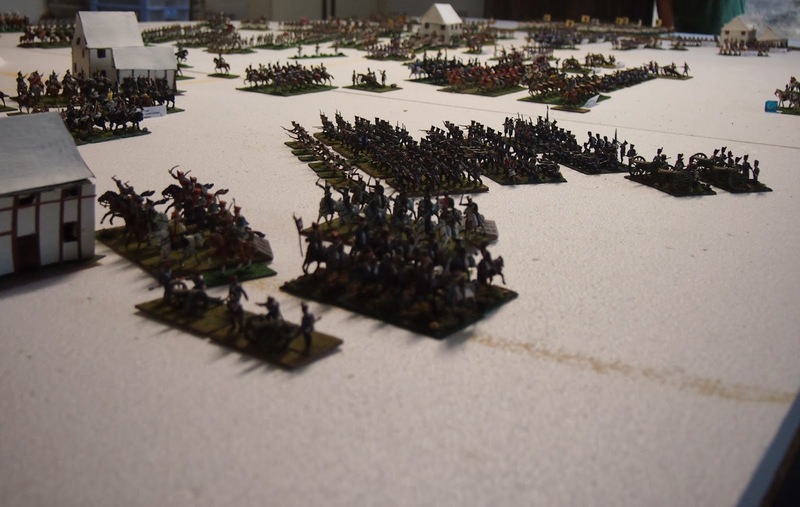 Briche's 2e and 6e dragoon's ganged up on Panchulitzev I's Kurland dragoons (played here by none less than the "mighty" Moscow). 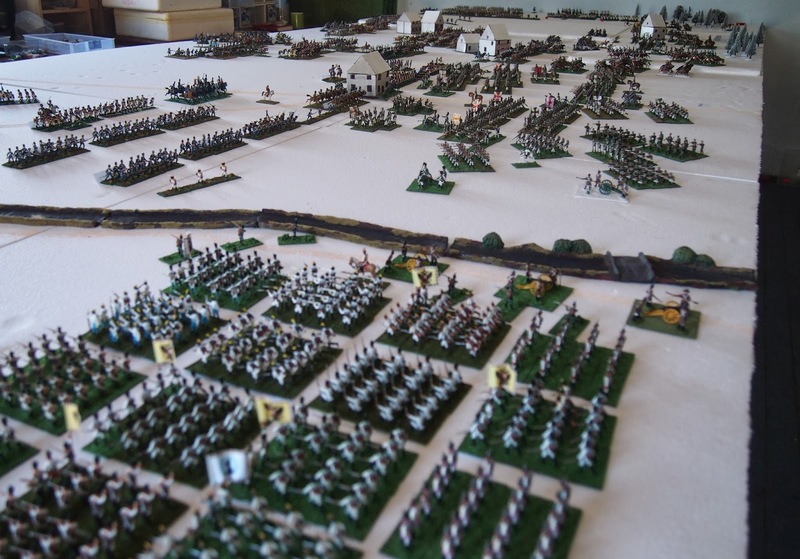 Gyulai's Austrians look impressive, but, with the impassable Aube on their right flank, will they be able to force the bridge at Dienville? 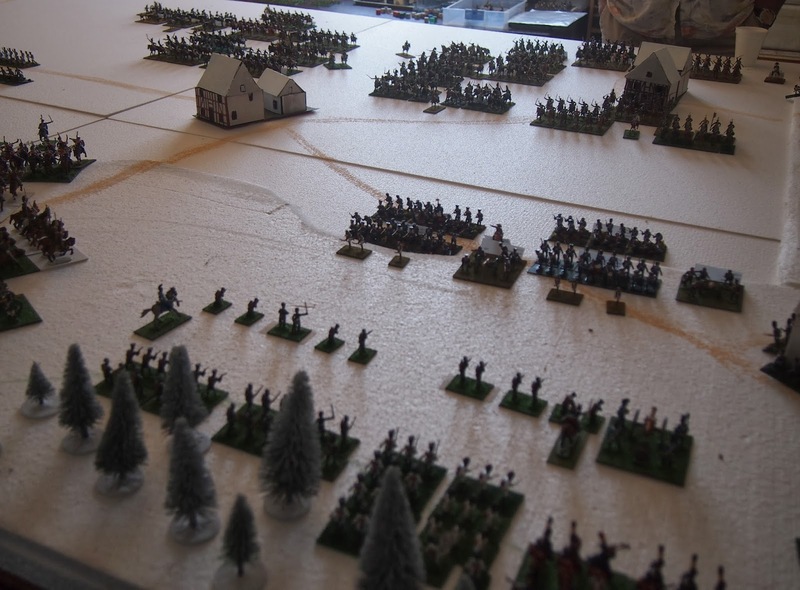 A good turn for the Allies i) La Rothière taken on the first attempt. 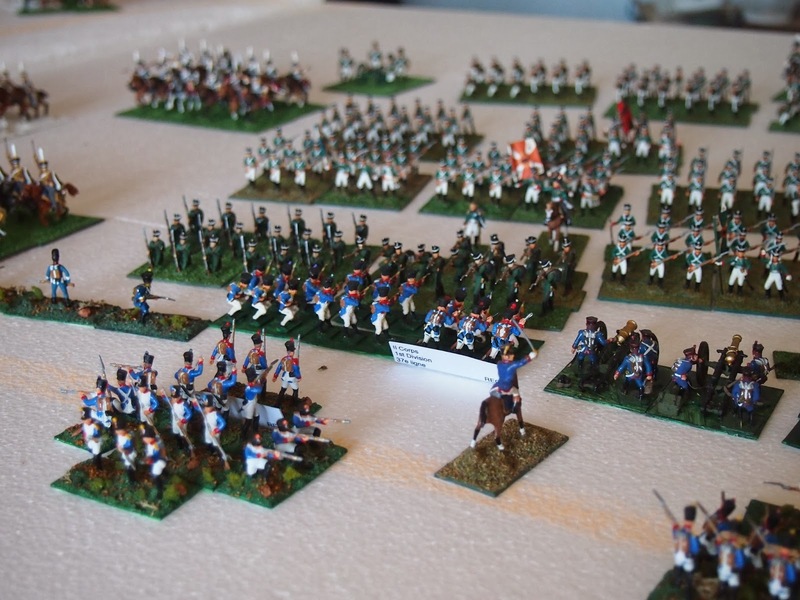 A good turn for the Allies ii) La Giberie in the hands of Eugène (of Württemberg)'s national troops. (Above and below) a good turn for the Allies; ruined! 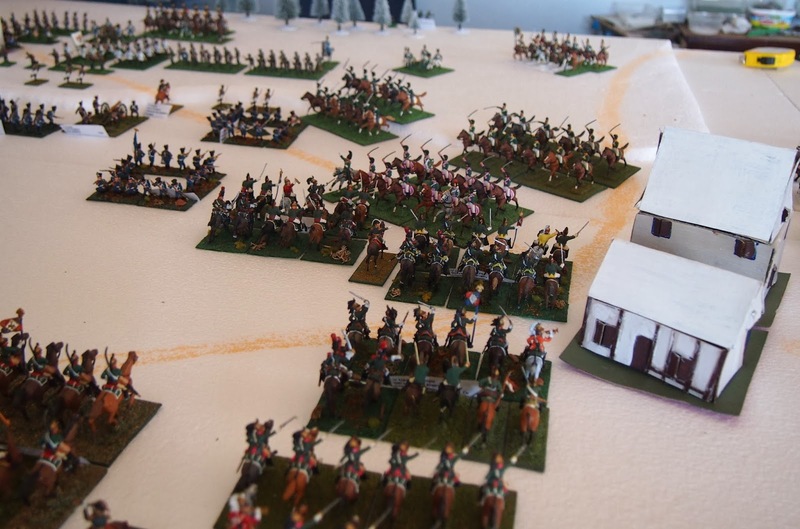 Lanskoi's and Panchulitzev I's cavalry came off the worst against Guyot's guard cavalry and Briche's dragoons respectively. Beaten back, but not broken. Lets' pause to take stock of the situation. 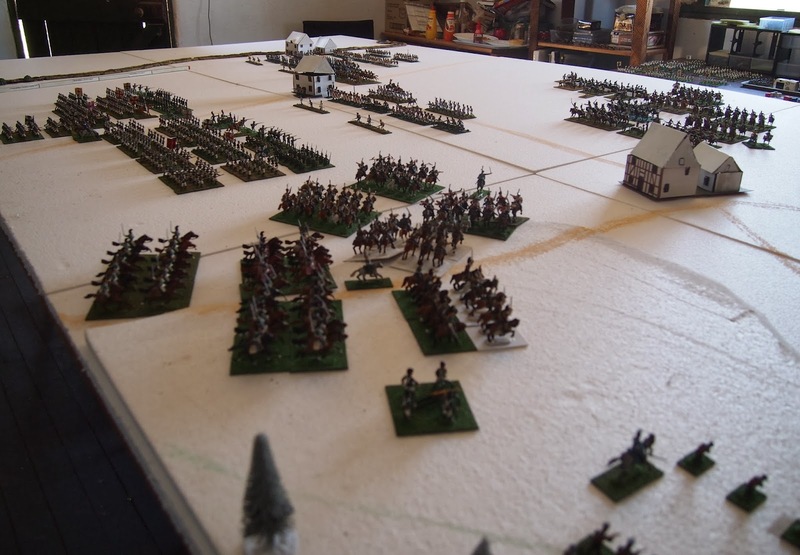 In the foreground, Gérard's troops have advanced beyond Dienville to support Duhesme (1st Division of Victor's II Corps) who are holding against the strong attack from Talyzin's 7th Infantry Division (Sacken's VI Russian Corps). 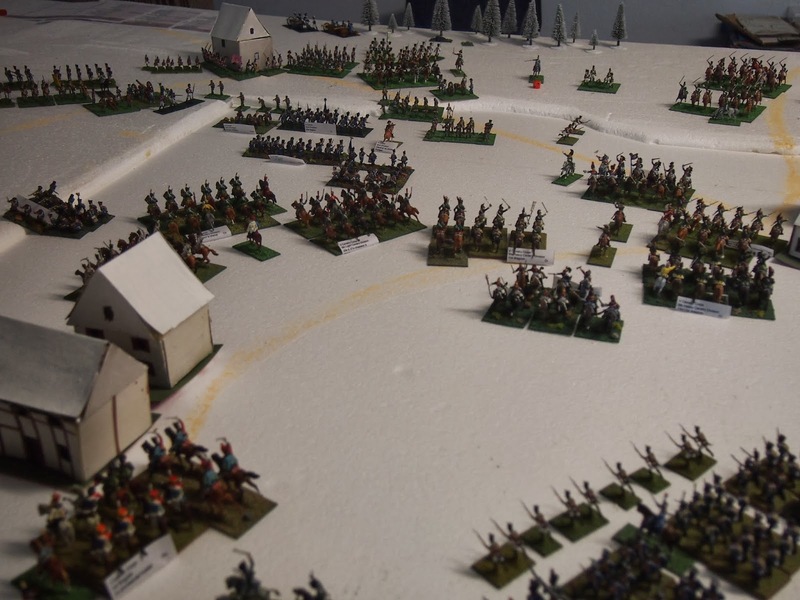 Gyulai's Austrians are moving steadily through the snow. Down and in close we see plenty of green coats against Duhesme's thin blue lines around La Rothière. 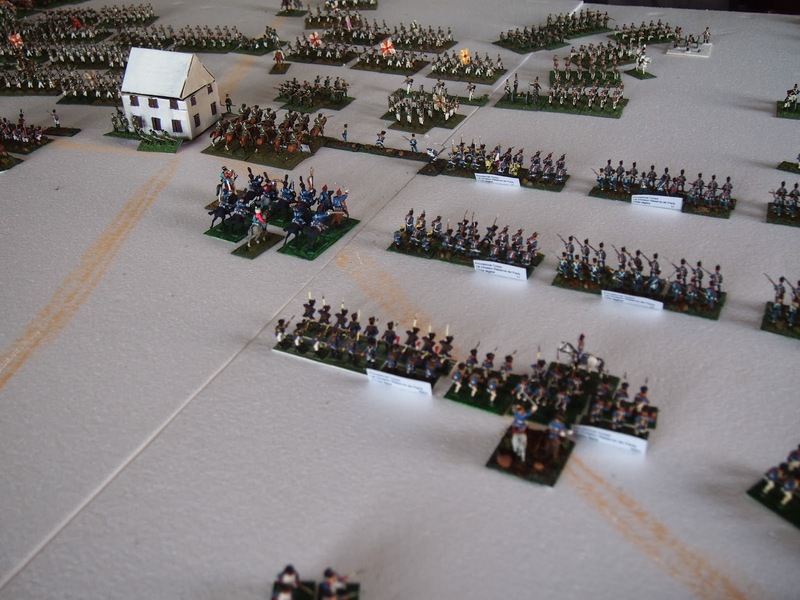 as von Wrede's lead Austro-Bavarian divisions begin to pressure Marmont's position on the French left flank. 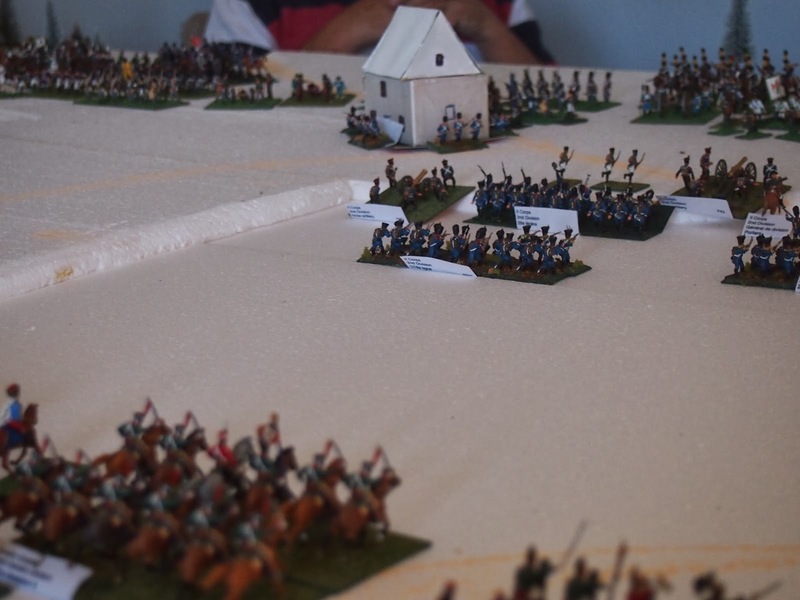 Back with the action, Bernadosov's second concerted attack broke through the first line of Duhesme's defenders. 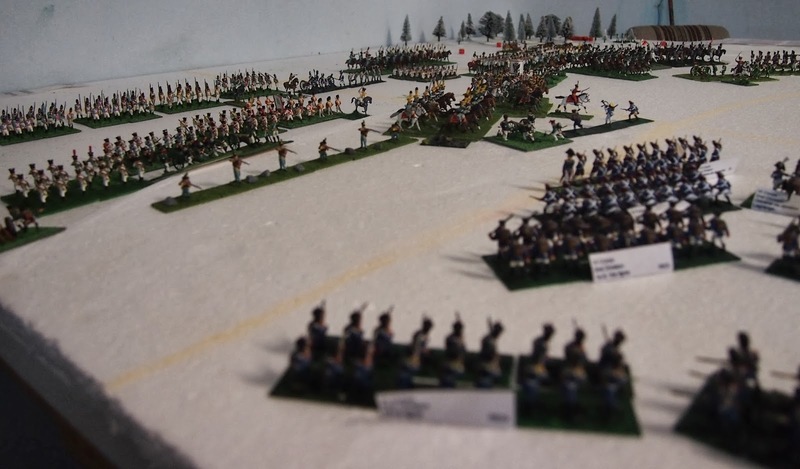 the Young Guard grenadiers à cheval were caught blown and stationary by Lanskoi's Alexandria hussars and easily broken. A stroke of good luck for Duhesme at last with his division passing it's morale test at 50% losses. 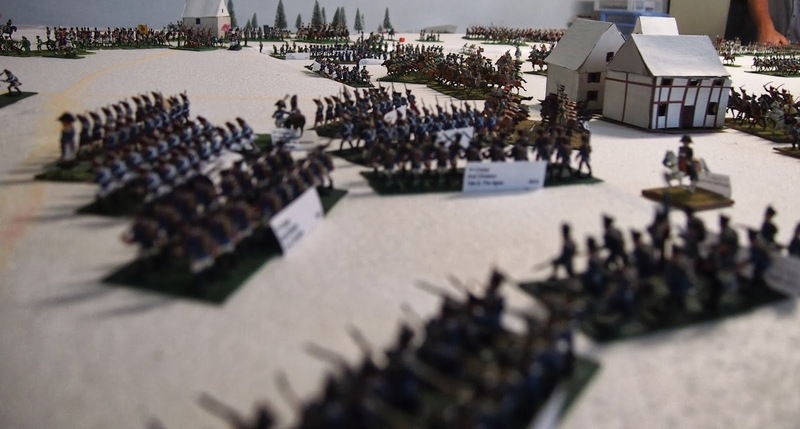 West of La Rothière, Gérard has moved his troops further forwards in support of Duhesme's right flank. 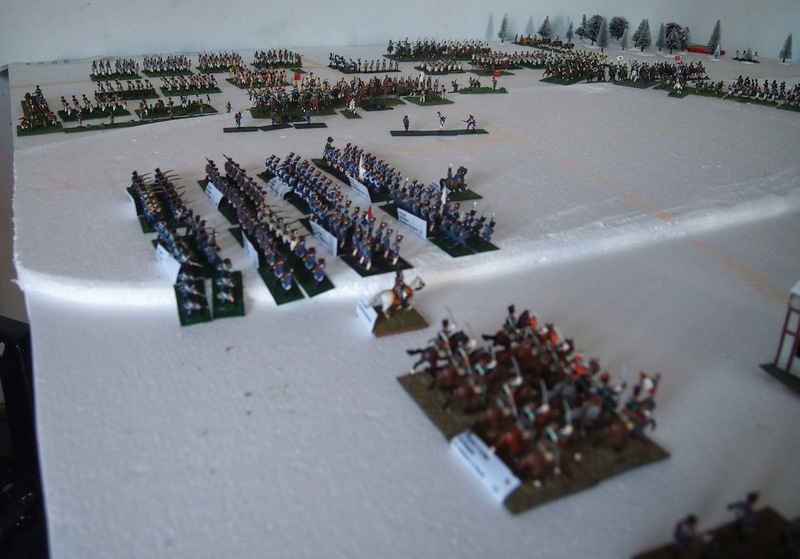 At the eastern end of the battlefield we see the concave mass of von Wrede's corps as it moves inexorably towards the French left defended by Marmont's weak 'corps' (comprising only Lagrange's division). Yet, the centre is all French at this stage. 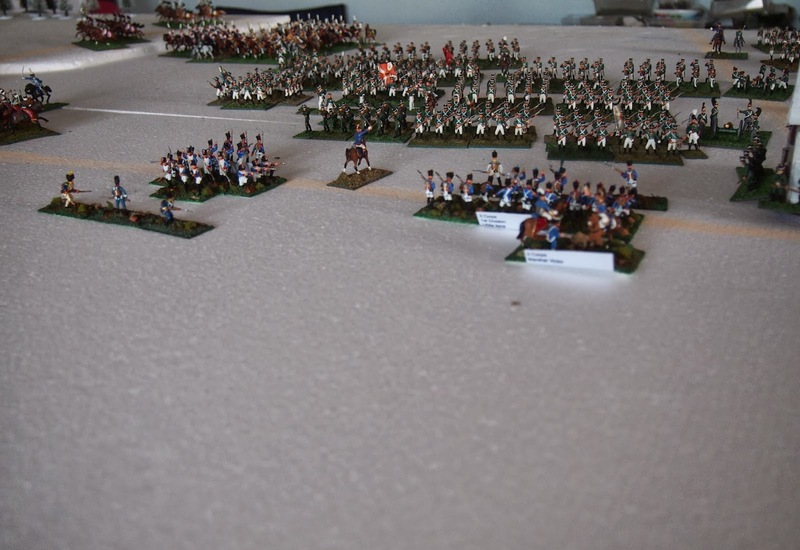 L'Heritier's dragoons have joined Briche's and have nearly driven off Panchulitzev I's Russian horsemen. 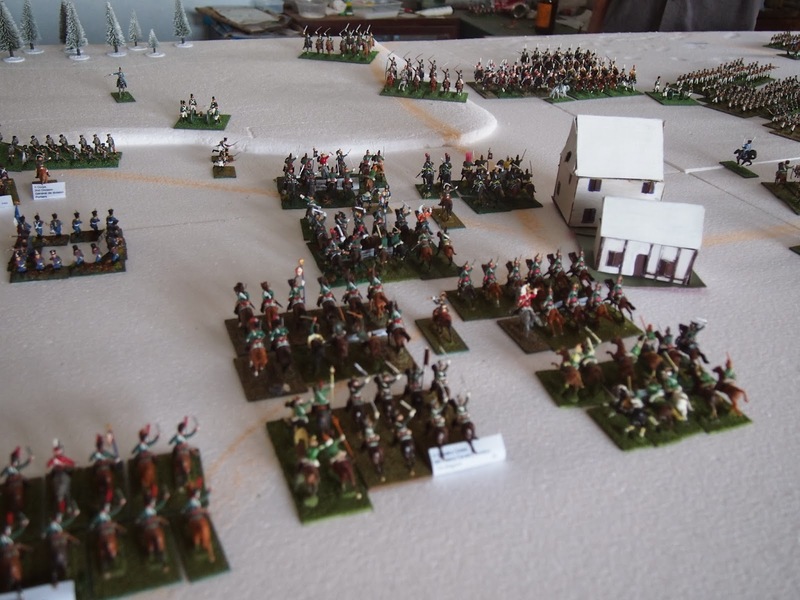 However, a crucial bit of luck to match Duhesme's sees both they and Lanskoi's cavalry rallying on-board and pass their crucial divisional morale tests. 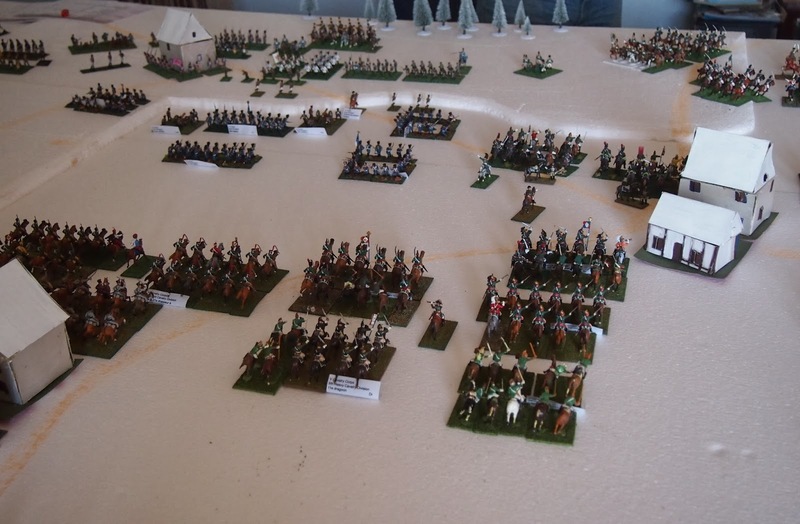 I'll conclude this report of part one with a pictorial summary of the game at the end of the 15:00 turn (Turn 5). No words, so that you can hear the blizzard, smell the smoke and feel the intensity of the struggle! I'm relieved and pleased that the scenario appears to be working out well, since I took huge liberties with the scales. I calculated the units at 1:33 (down from the usual 1:50–1:60) and scaled up the terrain to 1:2 (mm:m) from the usual 1:1 (mm:m). Not one for the purists, but it seems to have worked—at our scale of approximation, at least! 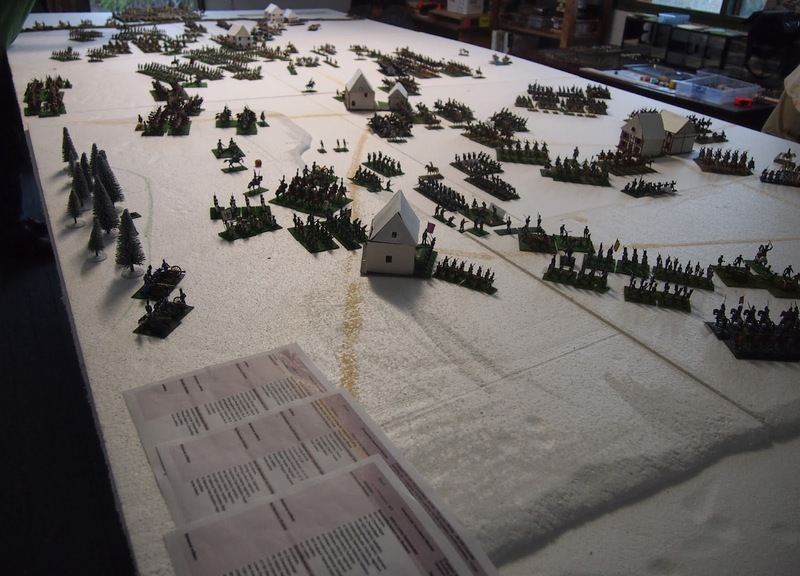 It was a pleasure to have two of our honorary members of the ANF, Mark (aka Marc for this game since he is leading the French left flank) and Stephan (aka Stefan since he is playing as von Wrede, the Bavarian traitor, for this game—writing with my Franco lens fully on!!) join us for this opening gambit. 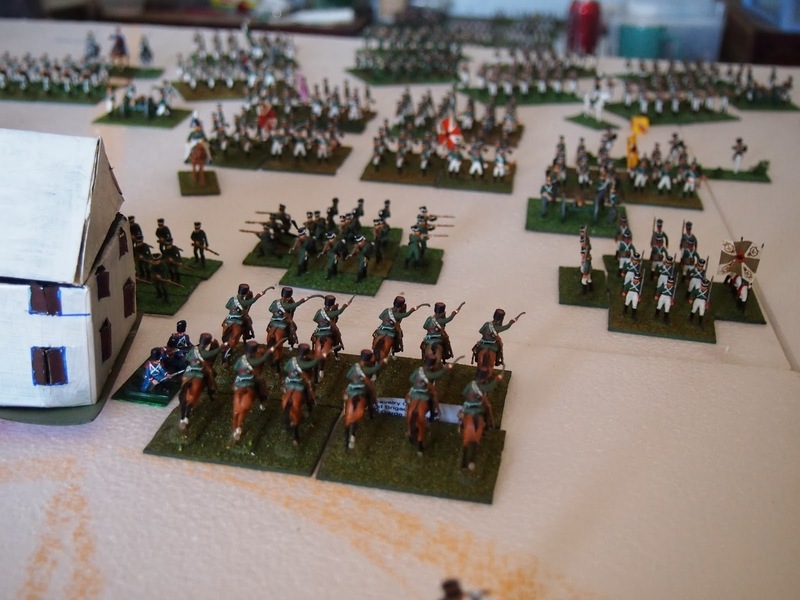 We intend to complete the game this coming weekend (8th March) and, all going well, they will be joining us again. 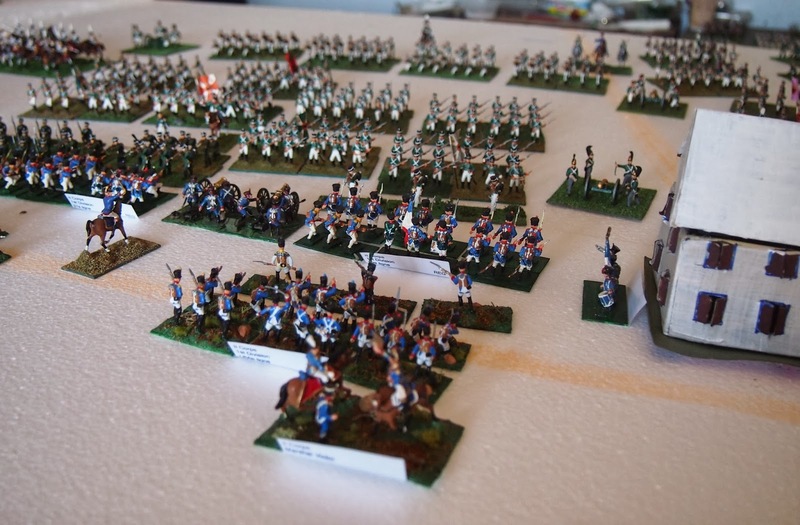 Looking impressive - this is one of those battles I have an eye on emulating on the table top. Snow can be a problem but your solution works remarkably effective given its apparent simplicity. Great post, looks like you had fun too. I recall a post of yours last year showing some good looking snow terrain Jeremy. 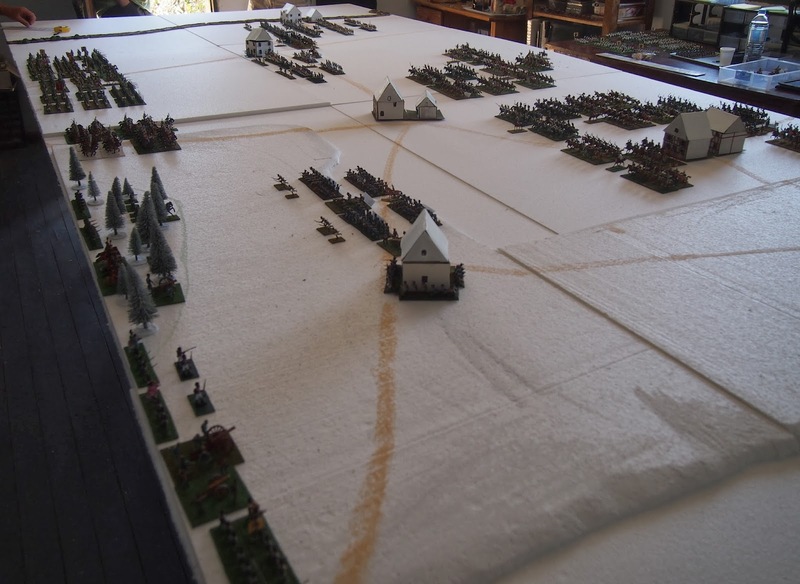 We go for easy, functional, re-usable terrain that looks good enough (for us), so unpainted polystyrene foam sheets fit the bill! 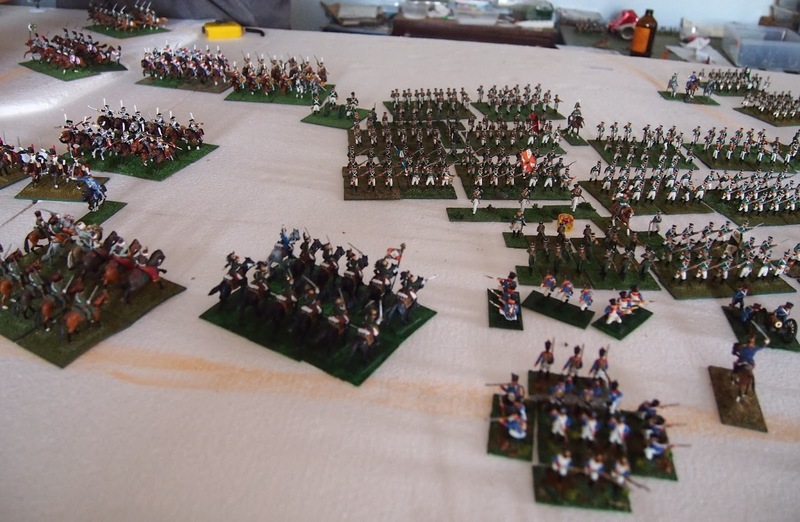 We tried it firstly with Eylau and were really pleased with the 'look'--plus it was great as a playing surface. 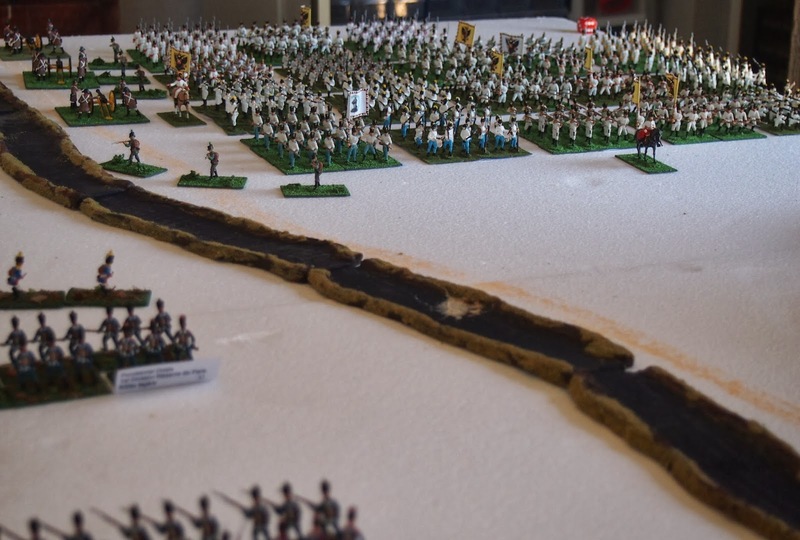 There's no expense spared too, with the innovative, new wargaming terrain effect called 'chalk' that we use for the roads! Very impressive looking, James. 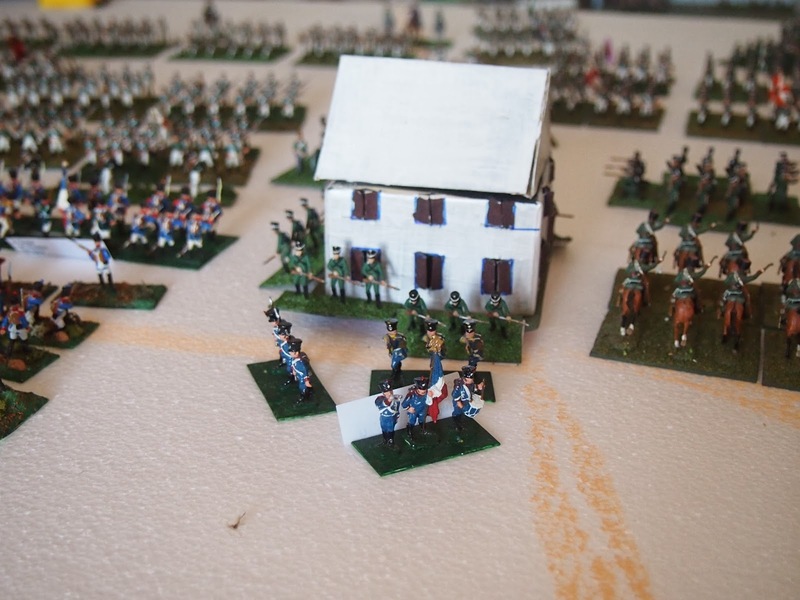 I am planning on doing Montmirail at Historicon in July, and am debating whether to do a second 1814 action, or reach back to 1813 (probably the Katzbach or Gross Beeren). I shall have to give La Rothiere serious consideration! I have the winter stuff from Eylau, so not much new should be needed. BTW, the landscape here in Connecticut looks pretty much like your table, and has for the past 6 weeks. More snow on the way next week! I have not forgotten that I'm sending the scenario to you Peter. I thought I'd wait until we are finished, so that I know how the victory conditions work (or do not). I s'pose it is more fun playing on snow terrain when it is sunny and warm?! The last 2 years it has been over 100 degrees F in Fredericksburg in July, however! I was most impressed by the whistling wind sound affect. 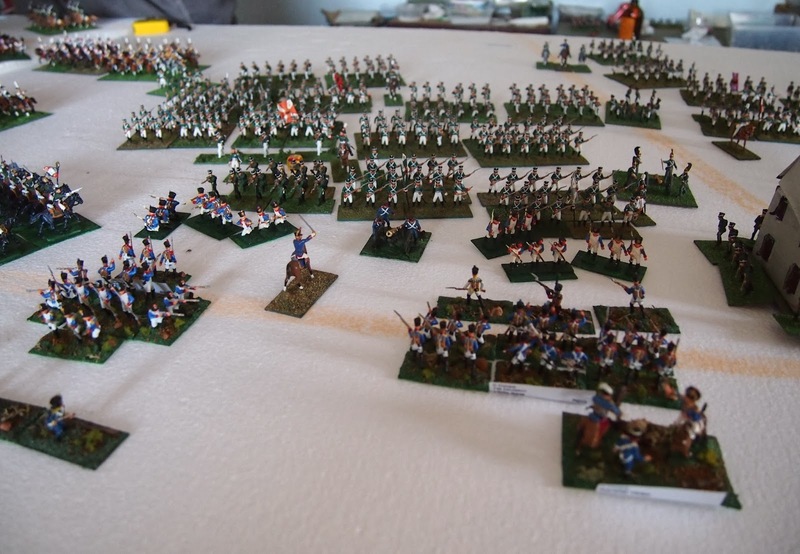 All those photos have come up well, especially those menacing Austrians. The labels blend in well. See you next Saturday. Pleased that you heard it too! 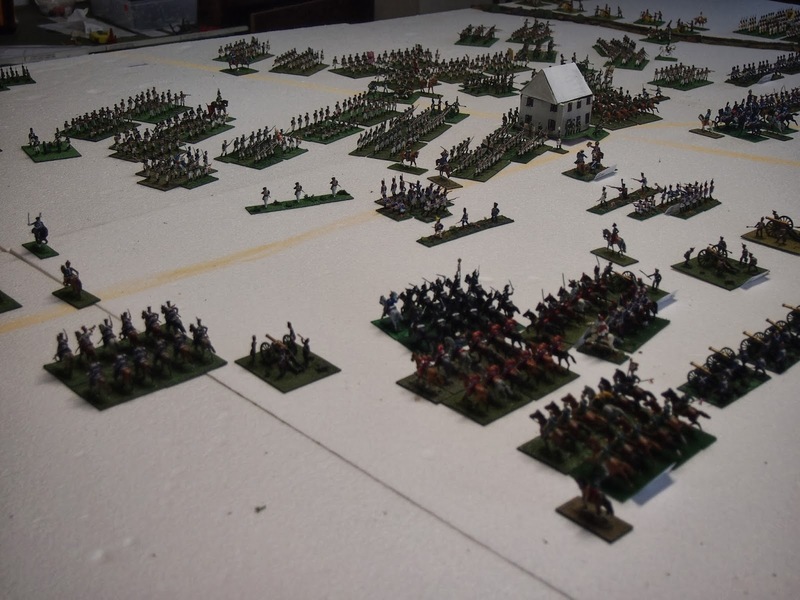 That MASS of Austrians just looks nasty ... if they can get into the battle ... ouch! Ice machine and all? Amazing! We played it out yesterday, so I'll try to post the report soon. Yes I have always tended to avoid snow as I don't wantbto be stuck with unuseable terrain,maybe as cloth. Looks a great game. Thanks Phil. 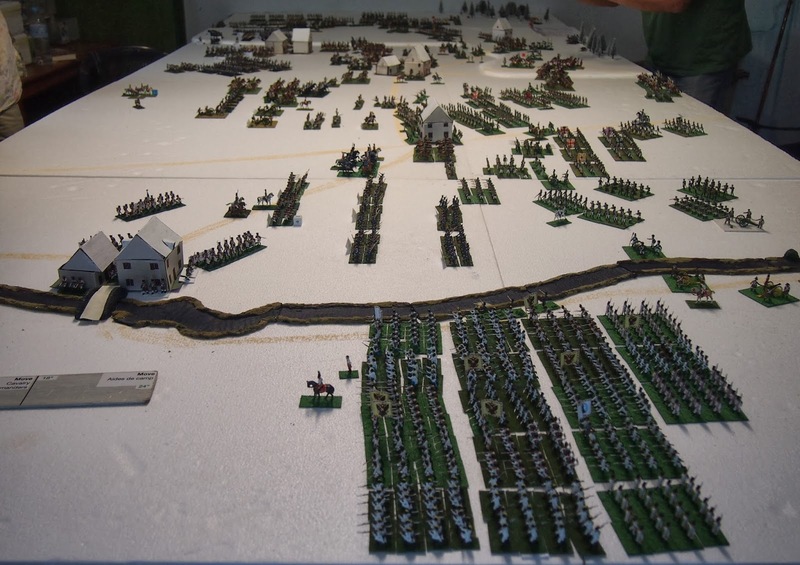 I'm the opposite and have been suggesting to the fellas that we should do all of our battles with snow terrain; Waterloo on ice perhaps?! Thanks so much Robert, your encouraging words are most gratefully received! I/we shall follow your blog with interest, now that you have alerted us to its existence! 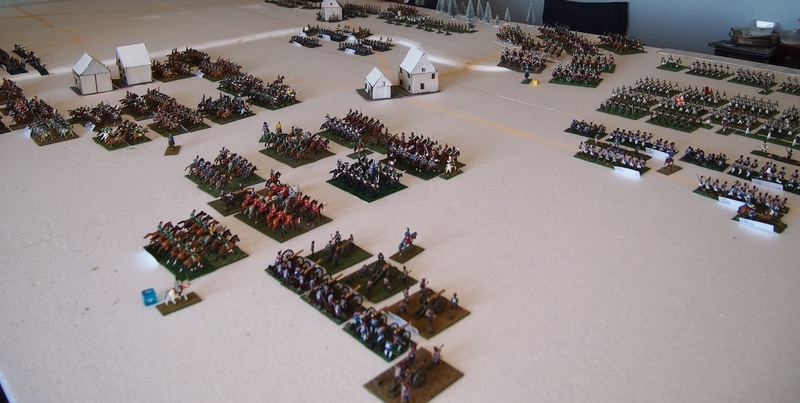 A great start...and a fantastic battle...I missed this first part, but therefore I could see the whole battle at once, very nice James, very nice..